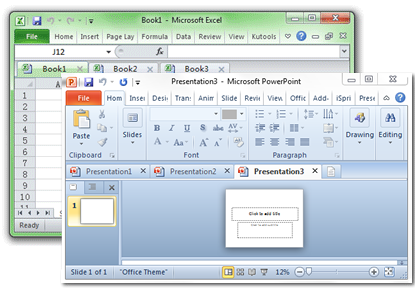 Edit, and Manage multiple documents in PowerPoint using Tabbed Browsing. New Version released! 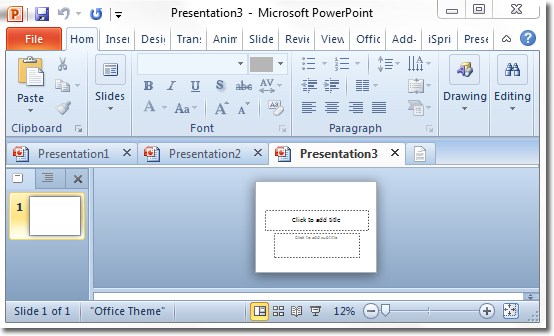 , 2013, Office365 and New Office 2016 ( PowerPoint, Word, and Excel). Minimize the windows you need open to just one. The tabbed interface allows you to open multiple documents in a single window. Each document appears as a new tab within the window (not a new window) and can be accessed with one click. This feature improves your efficiency when working with Microsoft Office programs (PowerPoint, Word, and Excel). Tabs can be moved easily by dragging. You can switch between tabs using the mouse or you can activate a tab by pressing Alt + N (“N” being the tab order "1, 2, 3"). You don’t have to open the "Save As" dialog to rename a file. Just click "Rename" on the Context Menu in the tab and enter the new file name it’s that simple! If you want to save the file in another folder, select "Save As" from the Context Menu.